Divers during specialized confined space rescue training. Due to the inherent and obvious risks involved, any company (or individual) engaged in commercial diving in the United States is regulated by the Occupational Safety and Health Administration (OSHA), specifically by 29 CFR Part 1910 Subpart T – Commercial Diving Operations. These regulations set forth the minimum standards that must be adhered to during any commercial diving operation. What do regulations and standards mean to a contractor who wishes to retain the services of a commercial diving company? To operate legally in the United States, a commercial diving contractor must adhere to relevant OSHA minimum standards. These are, as their name implies, the minimum requirements that must be met in terms of safety, proficiency, training, and the number of personnel required on a commercial dive team. At Substructure, where we make commercial diving safety the top priority, our standards far exceed the minimum requirements set forth by the US government. 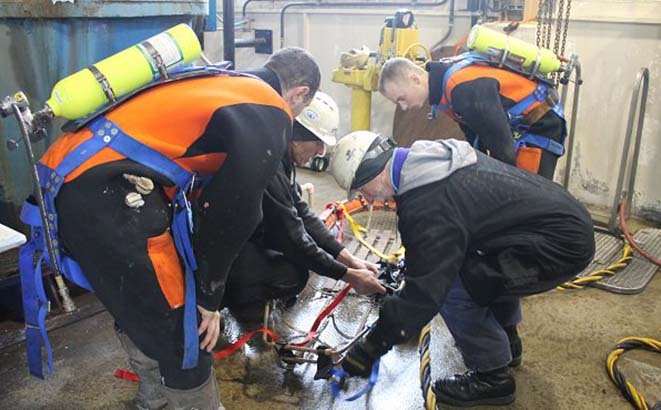 Our divers are trained at commercial diving schools accredited by the Association of Commercial Diving Educators, have undergone extensive in-house training, and continually hone their skills in the field. We are proud that our safety program is unparalleled. Note the advantages of Surface-Supplied Diving.